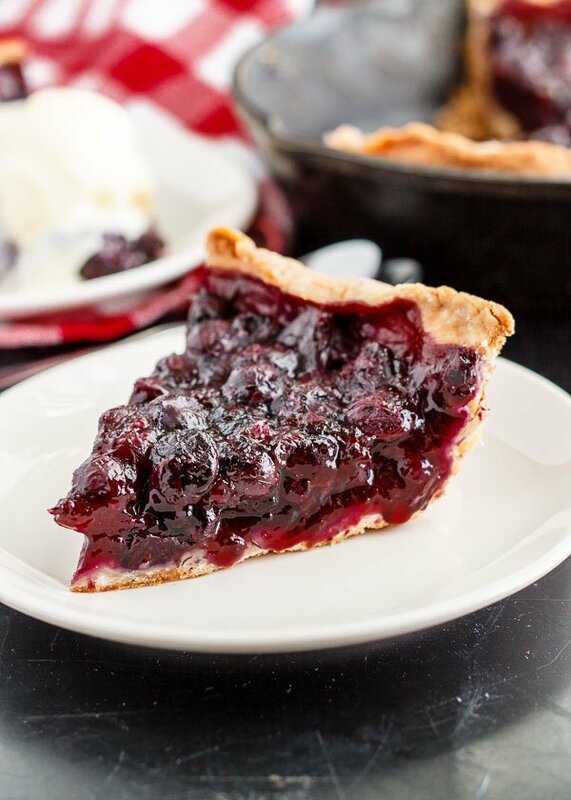 Fresh, juicy, and tart, this deep-dish blueberry pie gets baked into an extra thick all-butter crust, then heavily chilled for those hot summer days. It’s the perfect vehicle for a big scoop of ice cream. Eeeee, a clean slice and a perfect bottom crust. I used my favorite pie crust recipe given to me by my best friend Marnie. All butter, no shortening, and a unique ingredient. Instead of using it as a wash, an egg white gets mixed directly into the dough, which makes the crust noticeably more tender while keeping it sturdy. I’ve found that cast iron makes a very good pie plate. I used an 8-inch skillet for this pie. It’s smaller than a traditional pie plate, which means you can roll a smaller circle of dough, keeping the pie crust thick and leak-proof. The worst is a soggy bottom crust! The zest of a whole lemon gets mixed into the filling, giving this otherwise simple pie some oomph. Never underestimate the power of smell. We’re using instant tapioca to hold the filling together, which has a much cleaner flavor than cornstarch or wheat flour. Last, you must chill this pie after it comes out of the oven. Thoroughly chill it, then bring it back to room temperature or even microwave it if you wish. The filling needs time in the fridge to firm up. Otherwise, it will spill everywhere – insert disaster face! Plus chilled pie is just so refreshing. Are you a cold pie or hot pie lover? Cut butter into pats, then quarter each pat. Place in the freezer for 10 minutes. Whisk the egg white, vinegar, and water together. Place in the fridge. Combine flour, salt, and sugar in the bowl of a food processor and pulse to mix evenly. Spoon out about 1/3 of the flour mixture and set aside. Add the butter to the bowl of the food processor and pulse until you get a grainy mixture. Add the rest of the flour and drizzle in the egg white mixture while pulsing, just until the dough starts to clump. Dump the mixture onto a floured surface. Flour your hands too, then shape it into a ball. Divide in half, press each half into a round disk, then wrap in plastic wrap and refrigerate for 15 minutes. You will only be using 1 of the disks, so you can freeze the other one. Take one of the disks out of the fridge after 15 minutes, unwrap it, and place it on a floured surface. Flour your rolling pin, then roll the dough into a 10 inch circle. 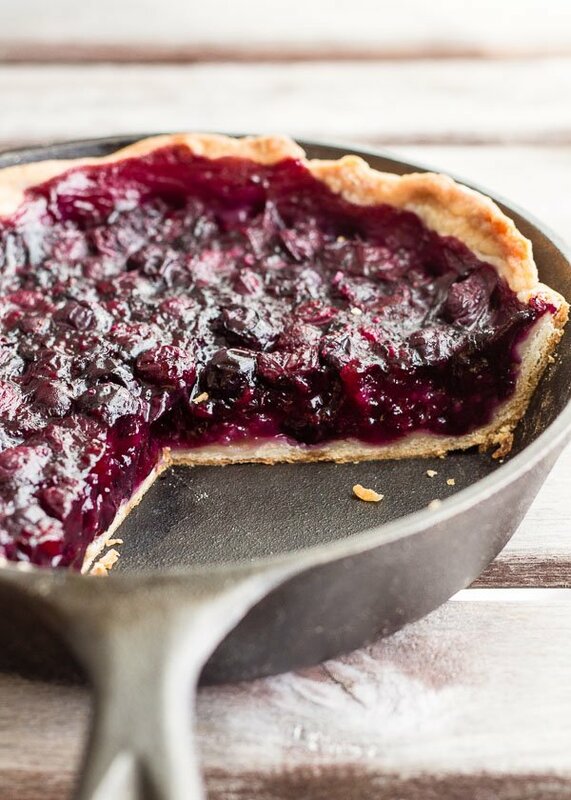 Lay it inside an 8 inch cast iron skillet, trim any overhang, and crimp the edges. Place in the fridge while you prepare the filling. Mix everything except for the blueberries together and let it sit for 15 minutes. This hydrates the granulated tapioca. Add the blueberries and toss everything together until the blueberries are evenly coated. Preheat oven to 375°F. Pour the blueberry filling into the chilled pie crust and bake for 20 minutes. 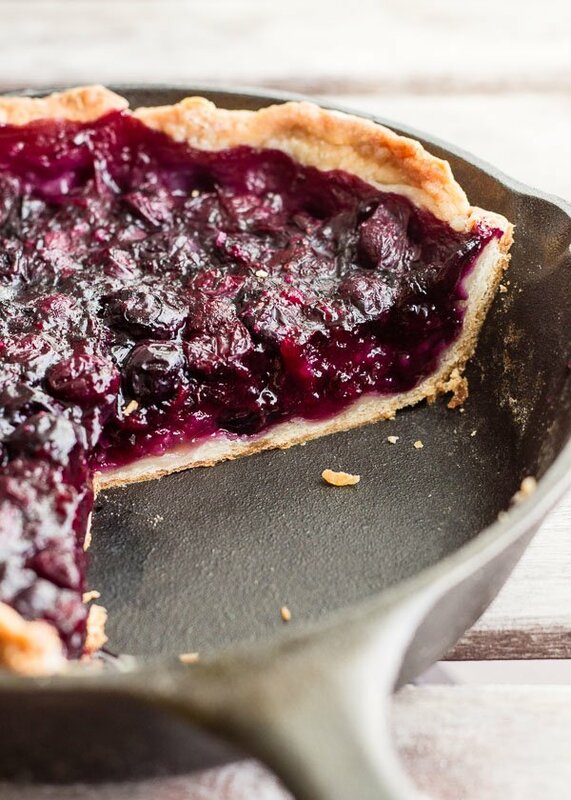 After 20 minutes, rotate the cast iron skillet, very gently stir the blueberries, then lay a sheet of tin foil over the top of the pie and bake for another 20 minutes. Cool completely to room temperature, then ideally, refrigerate for a few hours to ensure a clean slice. Serve with vanilla or lemon ice cream. You can use 2-3 tablespoons of buttermilk instead of vinegar and water. Love your cast iron skillet idea, Lu! I think blueberry pie is the quintessential summer dessert. Making a mental note to give your tapioca method a try! 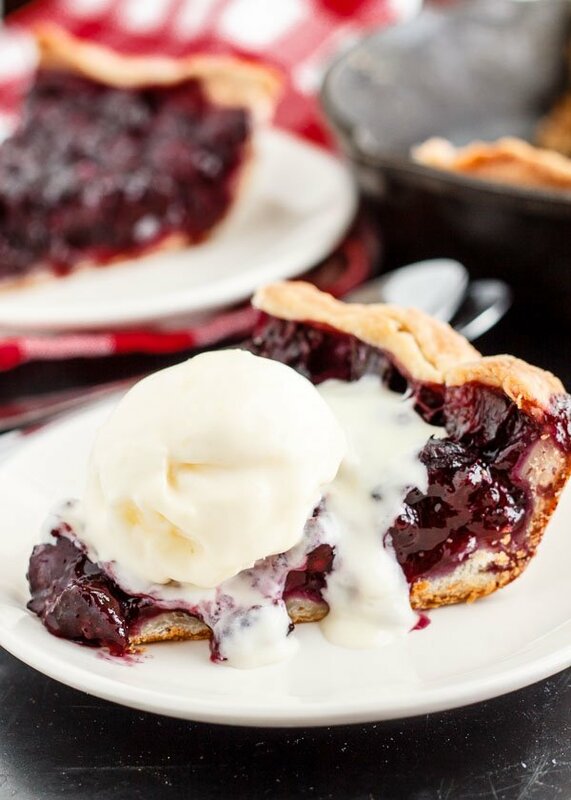 Ugh ALL I am craving right now is hot blueberry pie with a generous scoop of cold ice cream. This pie (and the images) are so mouthwateringly delicious. That is one seriously gorgeous pie – I’m wishing I had a big slice of it right now!! I’m intrigued by the use of egg whites in the crust. Yeah! It is intriguing right? But it definitely works. I found one other recipe on Serious Eats that calls for a whole egg. Might try that next time!